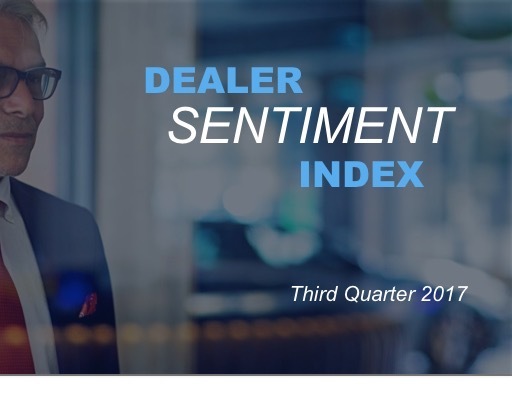 Cox Automotive Dealer Sentiment Index - Third Quarter 2017 - Cox Automotive Inc. Dealers were more positive about the next three months. The index score of 52 indicates more dealers expected conditions to be strong in the future, compared to those who think conditions will be weak. Derived from a quarterly survey that Cox Automotive issues to a representative sample of franchise and independent auto dealers, the Cox Automotive Dealer Sentiment Index measures dealer perceptions of current retail auto sales and sales expectations for the next three months as “strong,” “average” or “weak.” The survey also asks dealers to rate new car sales and used car sales separately along with a variety of key drivers including consumer traffic. Responses are used to calculate an index where any number over 50 indicates that more dealers view conditions as strong rather than weak. To see the highlights from the Cox Automotive Dealer Sentiment Index for third quarter 2017, download the full report. If you are interested in speaking with Cox Automotive Chief Economist Jonathan Smoke or need additional study details, contact Mark Schirmer, senior manager, public relations, Cox Automotive: mark.schirmer@coxauotinc.com or 734 883 6346.